This exceptionally powerful and unusually versatile power amp delivers good sound, ultra-wide dynamic range and offers lots of headroom for peaks. The Supercharger concept is particularly well suited for use with high-quality, low-power (valve) amps. Supercharger. It's a word that has an undoubtedly romantic ring, reminiscent of the Hon. Henry Birkin and his Bentley Boys, sweeping their way to four successive Le Mans victories in the 1920s. However, the automotive engineering reality is actually a little more prosaic, with the 'charge' simply being the explosive air/fuel mixture that's fed into the engine, and the 'super' referring to the process whereby the air is pressurised with a fan to get more 'charge' into the engine, thus increasing its power. The analogy with hi-fi may seem a little obscure, though it's not hard to understand why Musical Fidelity's marketing department has come up with the 'Supercharger' tag, for a component that does, at least to some extent, offer a new concept in power amplification. Of course, to the less romantically inclined, the 550K is simply a high-power monoblock power amplifier. To Musical Fidelity's patron, Antony Michaelson, however, it can also be seen as an excellent opportunity to 'supercharge' your existing system, enabling it to deliver truly realistic musical dynamics. To achieve this chameleon role, each monoblock unit is equipped with a 'normal' line-level RCA phono socket input, alongside a high-level input that's accessed via a pair of speaker terminals. The 550K can therefore be used as a regular power amplifier, fed from a preamplifier, passive system controller, or a variable output CD player. However, for its intended Supercharger role, the 550K needs to be located close to the loudspeakers. The speaker cables are then disconnected from the speaker and reconnected to the 550K, while the extra speaker cables that are supplied with the amp are connected to the speakers. Find somewhere to plug in the IEC mains lead and, hey presto, the system now has more than 550 watts of power. Inserting the complexity of an extra power amplifier into the hi-fi chain might not sound a particularly good idea from a transparency angle, but a compensating advantage is that the less-powerful system amplifier is freed from the relatively difficult task of driving a complex loudspeaker load. Driving the 550K's resistive (approximately 55ohm) input should make its life significantly easier. It's tempting to ask why anyone should need - or even want - that sort of power? Some would argue that hi-fi's true purpose is the replication of live music in one's living room, and while that might sound philosophically appealing, one can question whether it stands up to practical scrutiny. While it's reasonable to suggest that it might be feasible to pretend a soloist is performing in one's lounge, it's clearly unrealistic to mimic a symphony orchestra or rock group. Nonetheless, one can fairly argue that a more realistic target is to match the sound levels found in a live venue, which can certainly be very loud (105-110dB is a good target range). There's a significant difference, however, between generating realistic levels in a large space like a concert hall or the open air, and doing so within the confines of a small room. Musical Fidelity makes a pretty good case for using a high-power amplifier on a number of grounds, in particular stressing the desirability of being able to generate realistic levels without any risk of causing clipping on dynamic peaks. However, it's also the case that personal taste plays a role. We don't all live in solid, detached dwellings that permit realistically high levels, and personal taste in music also varies enormously. For example, most popular music has a relatively small dynamic range of only a handful of decibels, whereas an accurately recorded solo piano has a huge peak-to-mean ratio, and therefore requires a much larger amplifier to avoid clipping on the peaks while still maintaining a good mean level. Features are limited to a signal-sensing 'auto-on' circuit that reverts to a low consumption stand-by when not in use, plus three little status indicator lights. Single-speaker terminal pairs are used for both input and output, with no provision for bi-wiring. Within the Musical Fidelity product portfolio, it's closely related to the kW550 - a two-box stereo integrated amplifier that separates the power supplies from the amplifier proper. The 550K effectively re-packages one of the power amp sections with an associated power supply, while omitting the preamp circuitry. How is this amplifier able to generate so much power? Basically, because it's two amplifiers in one, operating in bridged mode, fully balanced and with a floating earth. By bridging two amplifiers, the available voltage swing is doubled: double the voltage across a load and you double the current that flows through it. However, since power is voltage multiplied by current, the power output is actually quadrupled. By this means, two 150-watt amplifiers bridged together become one 600-watt unit, provided the output devices are able to handle, and the power supply capable of delivering, sufficient current. Since each 550K has twelve output devices and a 620VA transformer, that shouldn't be a problem: the spec claims a rated power of 550W/8ohms, 750W/4ohms. Inserting the 550Ks into our regular reference system provided some sound quality clues, but hardly makes for an appropriate overall system package. Although the 550K makes good sense as a device for driving the difficult load represented by Bowers & Wilkins 800Ds (which are themselves well capable of handling a kilowatt or so of power), inserting a £3,000 power amp after our regular £10,000 Naim NAP500 would seem a potentially retrograde step. While the 550K does seem to add a little extra power and headroom (theoretically, it offers about 6dB, which is useful though not enormous), it also added some of its own character to the sound, losing some of the top end sparkle and adding a little extra heaviness low down. A minor practical consideration is that the amplifier's 6dB gain might well cramp the bottom end of the volume control range a little, and exaggerate any background hiss present in the system amp's output stage. A much more logical partner was our venerable, but recently restored and much revered Leak Stereo 20 - a valve amp with a very fine sound quality. Like many valve amps it's distinctly underpowered, and is therefore an ideal candidate for supercharging. It also imposes a degree of its own character on the sound, and this was impressively preserved, albeit in a mildly modified form with the 550K Supercharger. This option of combining the attractive qualities of a favourite low-powered amp with the massive extra power and headroom of the 550K is an attractive proposition, and an obvious role for the unit. If the Naim experience had suggested it was sometimes better to avoid linking power amps in series, and simply use the Supercharger as a power amp, Musical Fidelity's own X-T100 amplifier, perhaps predictably, gave the opposite result. This 50-watt, two-box integrated amplifier is perhaps an ideal subject for supercharging, and so it proved. It's a pleasant enough amp in its own right, but adding the Supercharger via the speaker cable brought a substantial improvement, not only in terms of dynamic range and loudness, but also in perceived bandwidth and resolution at both ends of the audio range. The net result was a sound quality that was not just better, but substantially bigger in scale too. However, the sound quality obtained when feeding the 550K from the X-T100's pre-out sockets was rather less satisfactory, adding a degree of treble hardness that proved a disincentive to playing the system at loud volume. Summing up is difficult. 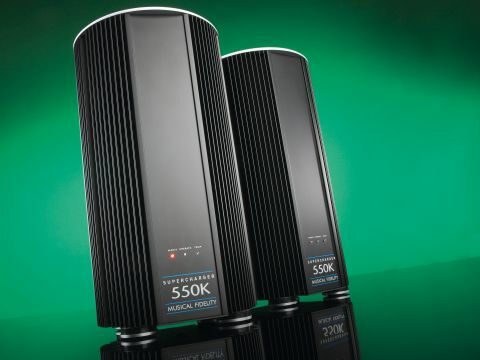 While the 550K is clearly a high-quality monoblock power amplifier that offers massive power output at a relatively modest price, the results of inserting it into a system Supercharger-style were not entirely predictable. The findings with Musical Fidelity's own X-T100 amplifier certainly validate the concept, but generalisation is risky: each case should be treated on its own particular merits.